To introduce vet students to opportunities in northern Australia, NABS recently provided three $2,000 subsidies to veterinary students. The subsidies are intended to assist students with the cost of travel and accommodation for undertaking placements on pastoral properties, with vet practices and placements with DPIR in northern Australia. Applications for placement subsidies in 2019 will open later this year; contact your regional veterinary officer or livestock biosecurity officer for more information. Having grown up on a farm in the Flinders Ranges, SA, I have always had a passion for working with large animals, especially cattle. Therefore, in July 2018 I organised to complete a two-week university placement at the Alice Veterinary Centre in Alice Springs. I had travelled to Alice Springs once before and fell in love with its stunning scenery, so I was keen to get back there. Travelling to the Northern Territory (NT) would simply not have been possible without a generous subsidy provided to me from the Northern Australian Biosecurity Surveillance Project. It helped enormously to cover my travel and accommodation costs, for which I am extremely grateful. During my stay at Alice Springs I was fortunate enough to be offered the opportunity to assist in taking blood samples from sentinel cattle and chooks with Peter Saville and Greg Crawford at the Arid Zone Research Institute (AZRI). I enjoyed learning more about how the regular testing of the blood from these animals is used to prove the absence of diseases in the region and to also detect the spread of local and exotic diseases. It highlighted to me how important sentinels are to maintaining and improving the biosecurity status of the NT. I was also kindly invited by Jocelyn Coventry to receive a tour of the Old Man Plains (OMP) Research Station, owned by the Northern Territory Department of Primary Industry and Resources. 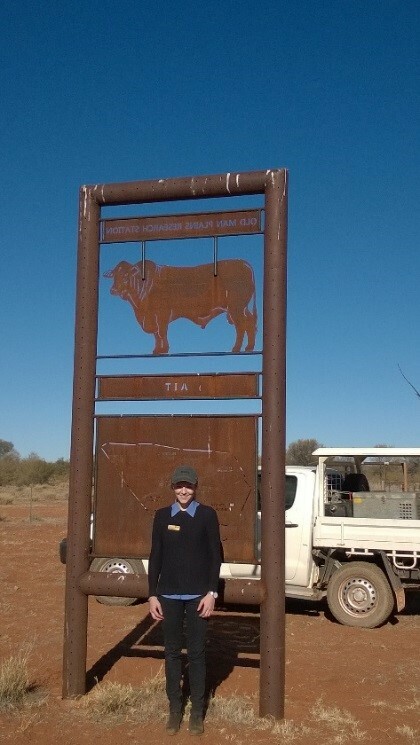 OMP is a 522k square kilometre property near Alice Springs used to conduct research into various areas, such as fertility and reproductive loss in Droughtmaster cattle. Jocelyn explained how she performs regular ‘calf checks’ in the breeding season to record observations for her research, including matching calves with their mothers and the different behaviours they display. The time I spent with Peter, Greg and Jocelyn definitely gave me a better understanding of what it is like to work as a veterinarian in the field of biosecurity. It also gave me a greater appreciation of how important biosecurity is to protecting the Northern Territories’ environment, economy and community. I would definitely consider returning to the region to work as a qualified veterinarian in the near future, as I enjoyed the challenges of working in a remote location and would like to get involved in working with Indigenous communities. I would highly recommend any veterinary student to undertake placement in northern Australia, as the experience I gained was like none other. I would like to again thank Peter, Greg and Jocelyn for giving up their time to teach me about the work performed at AZRI and OMP, the Northern Australian Biosecurity Surveillance Project for offering this subsidy and making this unique experience possible for me, and the Alice Veterinary Centre for hosting me for placement.